After thirteen days of protest and five days of hunger strike by five men of the protesting refugees on Sappho square in Mytilini on the island Lesvos (Greece), tomorrow five girls and women will join the hunger strike. 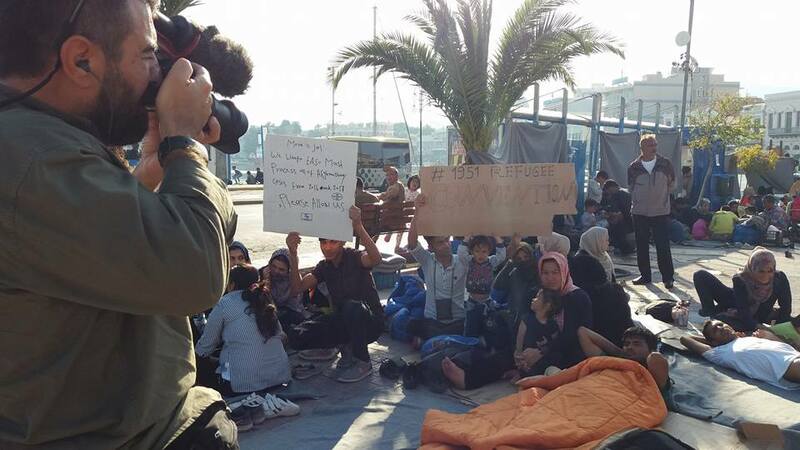 Image: Protesting refugees on Sappho square in Mytlini on Lesvos, Greece. Image by Arash Hampay Facebook page.Published by Enough is Enough. Many people probably think that some of the hunger strikers are too young to join the action. In fact they are, but they are also too young to die in a tent in the coming winter. Last year several refugees were frozen to death on Lesvos because they were sleeping in tents that were covered with snow in the cold winter. A Video that was made by Arash Hampay today (and uploaded to Facebook), showed that there are still people in the Moria refugee camp who have to sleep in tents. On December 16 some of the Enough is Enough team will return to Lesvos to report about the situation of refugees on the Greek island. Last time we were on Lesvos (September 2017) we produced the video above. Statement #RefugeesGR: Now Also Hunger Strike at #Syntagma in #Athens | Enough is Enough!